In a small mixing bowl, combine the orange juice and zest, soy sauce, vinegar, sugar, ginger purée, and part of the cornstarch. Mix well. Set aside. Season your beef (thinly sliced) with salt and pepper very lightly. In a shallow bowl mix the remaining cornstarch with baking soda. Pour oil just to coat the bottom of the skillet and heat over medium heat. 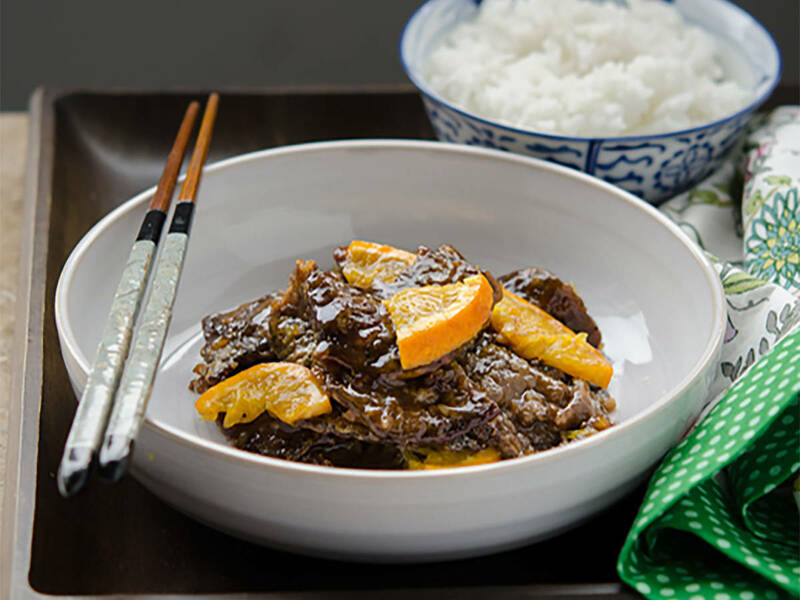 Coat the beef slices with the cornstarch mixture lightly and drop in oil in the skillet. Fry the beef for 30 – 60 sec. or until they are browned. Turn to the other side and fry another 30 – 60 sec. Transfer the beef onto a plate lined with paper towel. Set aside. Now, get your sauce, minced garlic, and a few slices of orange ready to go. In a clean skillet, heat some oil over medium heat and cook garlic for 10 seconds. Pour in sauce and let it bubble and reduce in half. Add in the beef slices and the orange slices, toss well to coat with the sauce. Remove the skillet from the heat and serve immediately with rice.